One of my recent goals has been to spend 10 minutes each day stretching. Let's face it. Most of us spend the majority of our day sitting down, and that takes a toll on our hips. Sitting shortens our hip flexors and leaves our glutes unengaged. As our hip flexors shorten, our lower spine receives more stress, which can lead to lower back pain. 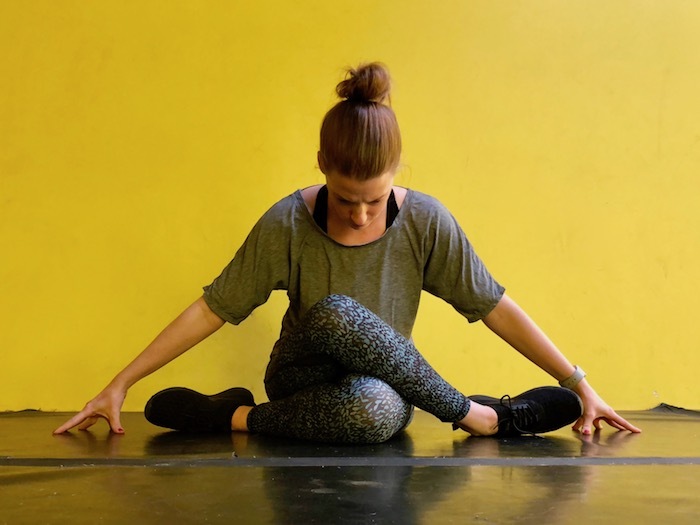 These basic stretching exercises are geared toward releasing tension in our hips and help us prevent injury and provide relief to such an important body part. Before getting too deep into the hips, take a minute in this position. This stretch lengthens your entire spine from the hips to the base of the neck. Separate your knees hip distance and walk your hands forward without dropping the hips down toward the feet. Continue to press the hips up and the base of the spine downward. Cross your legs and stack one knee on top of the other. Slide your feet to either side of your hips. Try to sit evenly on with your back straight. If you want to deepen the stretch, maintain a flat back as you lean forward slightly. Exit the pose carefully! Bring your feet closer to your hips and work the soles of the feet onto the ground as you slowly uncross your knees. Doing this pose against a wall lets gravity do the hard work while keeping your spine straight. Slide your hips toward the wall so that they are only an inch or two away and start with your feet straight up the wall. Gently open your legs and lower your feet toward the ground. To exit, use your arms strength to bring legs together and bend your knees, so the soles of your feet come in contact with the wall. Start in a lunge with your back knee on the ground and your front foot planted on the ground in a 90° angle. Slowly slide your back leg behind you and press into the hip flexor without having your front knee extend beyond your front ankle. To take this one step further, capture the back foot and slowly raise it to stretch your quad. This is a less rigid form of the Pigeon Pose. Bend one knee and slide it underneath your hips. You can experiment with bringing the knee more parallel in front of you or lowering your hips toward the ground. This can be a sensitive area, so listen to your body!